Neo Poly Dex Ophthalimic Suspension is a highly effective and fast acting prescription medication for cats or dogs, used to treat eye problems. 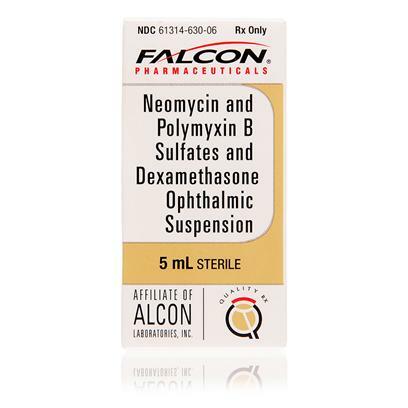 Neo Poly Dex Ophthalimic Suspension may be used to treat a variety of eye conditions including but not limited allergies, ulcers, scratches, corneal conditions, non-ulcerative keratitis and palpebral and bulbar conjunctivitis. The medicine may come in drops or as a more viscous ointment, depending on your preference and your doctor's recommendation. Neo Poly Dex Ophthalimic Suspension treats eye infections and injuries with a combination of antibiotics, and anti-inflammatory steroids. (Steroids are commonly used to help eyes heal.) Results are typically seen within 48 hours of administering the first dose. This medicine should not be given to cats that have the herpes virus. Neo Poly Dex Ophthalimic Suspension is the generic form of Maxitrol. Side effects are uncommon with this drug. Some cats may experience an anaphylactic reaction. If your cat appears to be wheezing or choking, call the vet immediately. Prolonged use may cause another bacterial infection, so follow the instructions and do not administer the drug past the prescribed date. Results should be evident within the first 48 hours. If combining this drug with other topical eye treatment, wait at least five minutes before adding any other drops your pet’s eye. When applying ointments, place one hand under and around your pet’s chin and lift upward, so the pet’s eyes are looking towards the ceiling. Pull down gently on the lower lid with a finger or thumb, depending upon which eye you are treating. Rest your other hand on top of the pet’s head. Be sure the tip of the tube is pointed away from your pet’s eye so if your pet jerks, the tube tip will not injure the eye. Hold the tube of ointment about one inch from the eye and apply a short ribbon of ointment along the inner edge of the lower lid, starting at the inside corner of the eye. Rotate the tube when you reach the outer portion of the eye to help detach the ointment from the tube. Have your pet blink, and gently hold the eyelid shut. Gently massage the closed eyelid to disperse the ointment. Ointments will blur your animal’s vision for a few minutes after administration. Prevent your pet from bumping into things and becoming injured. If using eye drops,shake the suspension well before using. Follow the directions above, but squeeze the drops into the corner of the eye, taking care not to touch the sterile dropper to the eye surface. Continue to hold the head back for a moment while the drops disperse over the whole eye surface. Never touch the tip of the tube or dropper to the pet’s eye, lids, or eyelashes. Do not touch the inside of the cap or the dropper or tube tip with your fingers, as this will also contaminate the medication.